The WEB version of the childcare support system is aimed at collecting important information about children, practical utilization for children and caregivers, and connecting to the future. Faced with low fertility and an aging society, it is urgent for the isolated childcare environment to utilize both qualitative and quantitative support measures. The increased number of children who need special care such as those with developmental disorders and those who have suffered child abuse has become a social problem, and society’s expectation has called for greater support from childcare professionals. It is an important policy to develop support for abuse prevention and disabled children, which is associated with providing daily life support for children and caregivers. The latest childcare policy emphasized the importance of evidence-based support, assessment, and self-evaluation. The childcare professionals are expected to make flexible use of the support loop with “evidence-based practice,” such as “precise practice,” “evaluation,” and “utilizing feedback to improve practice,” based on the “identification of the true needs of children and their caregivers.” Moreover,“earlier detection of children who need special care and high-quality childcare support involving implementation, evaluation, and cooperation” are still expected. 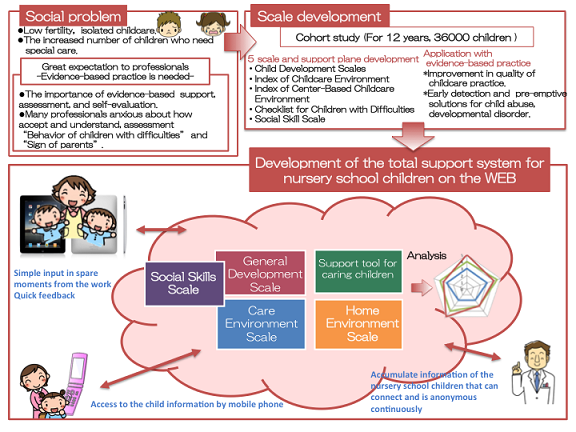 We entered 5 evidence-based tools (Child Development Scales, Social Skill Scale, Checklist for Children with Difficulties, Index of Childcare Environment, Index of Center-Based Childcare Environment) into the WEB system through a 17-year childcare cohort study that allows for flexible utilization of these tools and a better capture of their expected results and applicability. ● You can log the data into an enlarged screen by touching it; results will turn into a graph quickly. ● You can not only make nationwide comparisons, but also have access to individuals’ development information over time. ● Alerts and hints are provided for children who need special care. The system with the above characteristics contributes to daily childcare. ●It is available to you wherever there is Internet access. ●It can be used with any smart device, such as computers (Windows and Macs) and tablets (iPads). or have any questions, please contact us.